Summary: Within its category the Kettler recumbent exercise bike is hard to beat. It looks great, has a detailed display and programs which can work with heart rate monitors and is way more comfortable than upright exercise bikes. This model comes with a generous discount at amazon.co.uk you can check out the product page for more. If you have any sort of balance or mobility issues but you’re still keen to take advantage of the massive health benefits that come from regular cycling, then the Kettler Recumbent bike is a must have. The ‘recumbent’ simply means that you’ll be sitting back comfortably while you pedal, instead of upright in the normal saddle position. You can still get a great cardio workout from this position – and it is way more comfortable. The Kettler R has 16 levels of resistance are delivered by an electromagnetic system via the compute – this means you will not have to stop and manually adjust the resistance as you would with many budget level exercise bikes. This bike has a solid 9kg flywheel which keeps the ride smooth. Your comfort is also assured – via the padded seat and easy grip, adjustable handlebars. The frame is sleek yet sturdy and built low to make getting on and off easy. Finally, wide set floor stands ensure overall stability and it’s lightweight, making it easy to move and reposition. The advanced onboard LCD computer gives constant feedback on speed, distance, time elapsed, pedal speed, watts, calorie consumption and pulse, which is measured by touch sensors on the handlebars. Alternatively the Kettler Premium is fitted with a polar compatible receiver so you can use a chest strap if you find them more reliable. 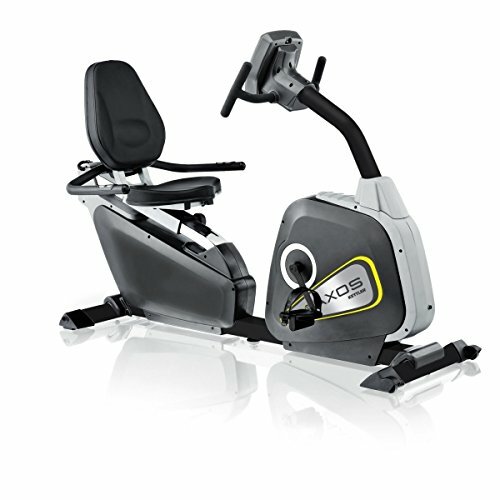 Kettler are a well known brand in the world of fitness and their exercise bikes have a great reputation. The Kettler R is more expensive than some other models, but for your money you get a durable bike with a sophisticated onboard computer. It comes with 12 preset exercise programs, 4 user defined programs and target heart rate mode, allowing to create challenging workout plans for yourself as your fitness improves over time. Feedback from customers has been mixed (though bought down as it was ‘not suitable for disabled son’ which skewed the ratings without actually reviewing the product!). Everyone has praised the sturdy, robust nature of the bike and that is is ‘whisper quiet’. Also coming in for rave review is the comfort of both the seat and the bike overall,.. Overall the Kettler R is a superior bike for those seeking a regular cardio workout, whether to improve overall fitness or mobility. The bikes’ solid engineering will help you avoid aches and pains while the onboard computer and it’s pre-set exercise programs will help you stay motivated. Check out the product page to see the full spec and latest amazon.co.uk discount.